The revamped proposal will include IRAs, DOL assistant secretary Phyllis Borzi confirmed at the FSI advisor summit. 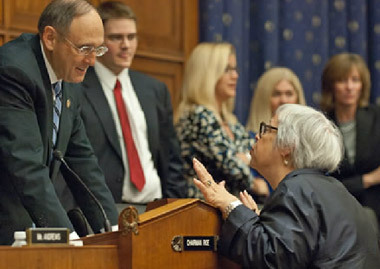 Phyllis Borzi appearing before Congress in 2011. EBSA’s semiannual regulatory agenda had said a reproposal to amend the definition of fiduciary under the Employee Retirement Income Security Act would come in October. But Borzi told attendees at the Financial Services Institute’s Advisor Summit in Washington that the October deadline, which was announced in July, was an “educated guess” of when a reproposal could be sent to the Office of Management and Budget (OMB). DOL is required to send its rule proposals to OMB, but the Securities and Exchange Commission is only required to send final rules to OMB. Once DOL sends OMB its reproposed fiduciary rule, OMB then checks the proposal’s cost-benefit analysis and gives DOL feedback on the proposal, asking for changes if necessary. DOL must then make the changes and have them approved by OMB before putting the proposal out for public comment. Borzi told ThinkAdvisor after her comments that she could not say when a reproposal would be sent to OMB. Industry officials were surprised, disappointed and thankful for the delay. “I am surprised” by the delay “considering the length of time that [DOL] has been working on the proposal,” Fred Reish, partner and chairman of the financial services ERISA team at Drinker Biddle & Reath, told ThinkAdvisor. Check out September Surprise: Fiduciary Supporters Lobby the SEC on ThinkAdvisor.